A wonderful Match Game and a cute collection of fishes for toddlers and kids. your kid loves Match Games , puzzles and want to explore the ocean ? This is the app for you! 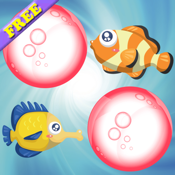 Fishes Match Games for toddlers and kids is an educational and entertaining game. It is a nice, simple, fun, and colorful game for toddlers and kids! Play with fishes ! A lot of different kids match games and many fishes to keep your kid busy. -touch the screen and try to match the fishes pairs covered under the bubbles, find the couple! Find out all the fishes hiding under the bubbles! - a fun and animated underwater world! - randomly generated Match Games! this educational game will never get old! Fun and enjoyable to learn and play with great colorful Match Games, this is a must have app! A lot of educational fishes Match Games for toddlers and young kids!! Your child will admire every kind of fish and will hear funny sound effects! This app is a brain trainer for all the family ! A fun brain training app for kids! Are you ready to challenge your memory ? Match up the fish pairs! Fishes Match Games for kids is a funny match game which also helps your kid training his memorization ability.